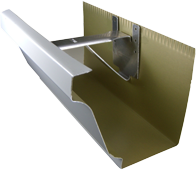 Gutters come in various shapes, sizes, and materials. Their purpose is to govern rain run-off and transport the water via leaders (downspouts) to grade or drainage systems and away from the foundation. Some municipalities (such as San Francisco) require that the downspouts be directly connected to the sewer. Others such as Berkeley are happy to see a downspout turnout at grade, but may require the installation of gutter-screens to prevent debris build-up, which could provide fuel for possible fires. Gutters are an architectural element and should be level and parallel to the buildings eaves. Water contained in the gutter will find the downspout opening, and so drain out of the gutter. If the gutter is sloped towards the downspout, even as little as 1/8per foot, over a relatively small distance of 10 feet you will have a 1 drop, and from the street it will look like the gutter is falling off. In truth, of course, there are very few level or perfectly straight lines, particularly with older buildings which have a tendency to settle, and nearly all gutters have some degree of standing water. Older buildings-particularly Victorians (and in fact many buildings constructed well into the 1930s) often have, or had, wooden gutters, which are typically nailed directly to the rafter-tails. When these systems are replaced, filler strips or new fascia boards should be installed as part of the replacement project. Ogee or K-gutters are probably the most common- you see them all the time. They look like cove molding in profile and are designed to mirror moldings often used in construction. Traditionally ogee gutters were fabricated from galvanized steel and required painting. More recently pre-painted seamless aluminum or 12oz. copper systems are extruded from coil material on-site and cut to fit. Ogee systems are available in different widths; typically 4, 5 and 6. Fascia Style gutters were developed in the 1940s and 50s to accommodate the demand for a more modern look and to compliment the simpler or less-detailed architecture of the day. With a sloping flat front they often look like a fascia board-hence the name. These systems are measured by depth, typically: 5 and 7. Coved fascia gutters with a concave rounded face are also available. Half-round gutters are simply that. Semicircular half-round troughs suspended below the eaves, typically on a Mission tile roof. These systems may have a rounded element at the front (single beaded) and sometimes the back as well (double beaded). Traditionally fabricated from copper, they are also available in steel and aluminum. Half-round systems are usually associated with round downspouts. Box gutters are generally custom-fabricated in various profiles to match architectural elements, to fit into pre-cut rafter tails or as a lining inset into a larger wood-framed element.